This ain't no reality show, guaranteed!!! Whether you are on a deserted island or in your kitchen in downtown Manhattan, this 4 pack of sauces will light you up. Filled with Dave's Insanity, Endorphin Rush, Marie Sharp's and Mad Dog Inferno, this 4 pack is perfect for a gift or to spoil (ruin) your own tongue!!! Are you nervous about giving someone a gift that might not be exactly what they want? 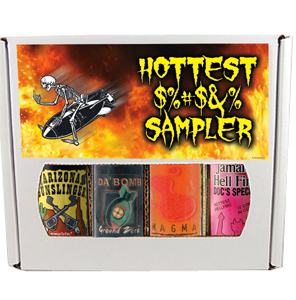 Let us take the guess work out of it and just give them the Mo Hotta Best Seller Sampler filled with four of our best selling sauces with a rainbow of flavor and heat. You cannot go wrong with this best seller 4 pack. Your gift will be the hit of the year!